Sales and marketing is a fast-paced environment, and there is never enough time to write good letters "letters that will communicate, convince, and close". Sales & Pitch Letters for Busy People will help salespeople at every level save time and avoid having to produce sales and pitch letters from scratch. 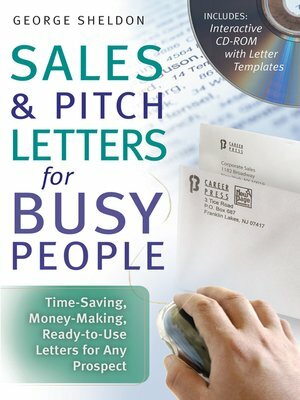 Sales & Pitch Letters for Busy People is a handy, quick-reference guide that not only tells you how to write virtually any kind of sales pitch letters, but includes a wide range of samples that you can easily and quickly adapt and use right now. This book includes concise, easy-to-use writing tips and resources that get "attention and results"! Packed with solid writing advice and useful techniques, it also includes a CD-ROM that contains templates not only for all of the sample letters included in the text, but even more. This guide will cut the time you spend on writing sales, marketing, and pitch letters by half "and will help you get the results you want and need". Don't worry about finding the right word or phrase, or even the right format of your sales correspondence "the work has been done for you". The letters can be copied, modified, and customized to fit your requirements. Creating and writing compelling and effective sales and pitch letters have never been so easy!